Edinburgh have high hopes that Jamie Ritchie and Magnus Bradbury will follow Bath-bound Dave Denton in becoming top performers in world rugby. Coach Alan Solomons admits that Denton will be missed after his sale to the English Premiership club. "But we've got some good loose forwards left behind," he told BBC Scotland. "And we've got two young Scottish guys coming through in Jamie Ritchie and Magnus Bradbury who I think are going to be big names in the game." 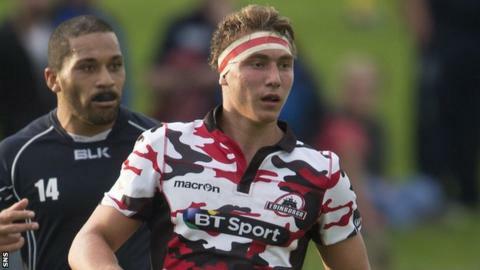 Both 20-year-old Bradbury and Ritchie, who is a year younger, have captained Scotland Under-20s and have made appearances for the Edinburgh first team since signing in summer 2014. Solomons pointed out that Denton had rejected an offer from Leicester Tigers that same close season. "I've no doubt it was a wrench for him," he said of the 25-year-old's decision to accept Bath's offer. "David has been made an offer and has made a decision to move on and I respect that." "It's a blow for Edinburgh because Dave Denton is a class act, but I think it's a good move for him and it will benefit Scotland in the long run. "He'll be exposed to a new environment and he's joining a good side, who play attractive rugby. "He's a player that gets across the gain line and that's absolutely perfect for Bath, who have a very exciting back line. He'll be loved down there. "I was a better player as a result of leaving Scotland - on so many levels. "As long as we don't lose them all - and I don't think we ever will - one or two going to England, France or wherever is good for Scottish rugby." Solomons hoped that he would not suffer more departures by squad members who impressed at the recent Rugby World Cup. "I think our squad's pretty together, we are trying to build something at Edinburgh and everybody wants to be part of that," he said. "I think David has made a tremendous contribution to Edinburgh Rugby and to Scottish Rugby. "These things happen. David will be missed. He's a valuable player, he's an outstanding player. "I've got a great relationship with him. I think he's a great bloke and a great player and I wish him well in this new opportunity." Edinburgh says last season's progress to the final will count for little as his side begin their European Challenge Cup Pool 5 campaign against Grenoble at Murrayfield on Friday. "Last year is last year," he said. "This is a different season. "We had Bordeaux last season, who are tough Top 14 opponents. We've got Grenoble this year, who are tough Top 14 opponents, so there's a similarity there. "What you can say is that we performed well and we will have to do that again this year."